Blend the rich flavors of buttery caramel, chocolate, and a pinch of sea salt into your coffees and specialty drinks with this Torani 16.5 oz. salted chocolate caramel flavoring sauce! The 16.5 oz. squeeze bottle minimizes drips for easy dispensing. Featuring a thicker consistency than liquid flavoring syrup, this flavoring sauce is great for swirling atop whipped cream or blending into sweet frappes. It adds the perfect combination of sweet and salty flavors to any freshly-brewed coffee or espresso-based drink. You can even use it to top ice cream, cheesecakes, and other desserts. This Torani salted chocolate caramel sauce will be the perfect finishing touch to any beverage or dish, and is sure to keep your guests coming back for more! Absolutely wonderful caramel sauce that is creamy and fresh straight out of the bottle! Highly recommend and encourage to grab this ASAP as it doesn't last long! the torani salted caramel flavoring sauce is one of the best syrups around. its great in cold and hot drinks mixed in and drizzled over the tops. such a bold flavor, and not artificial tasting. We use this syrup on our Frappuccinos. It takes amazing in It as well as on top and makes the crepes look great. Our customers ask for us to use this flavor specifically. The salted chocolate caramel flavoring sauce is great and makes for a great topping for hot cocoa. The sauce is sweet and decadent and truly a delightful dessert topping. A great specialty sauce that is a great balance of sweet and salty. The salted chocolate caramel sauce makes a great garnishing sauce for coffee or deserts. The bottle makes it is easy to dispense. This is our favorite torani sauce. The bottle squeezes easily and has a good flavor. It can be used for topping drinks, dessert, ice cream. Salted caramel is one of the new flavoring sauces that Torani offers. We are glad that we bought it as it is one of our more popular syrups at our ice cream topping bars. A very popular flavor and so rich and decadent with a touch of sea salt. It is so good drizzled over vanilla ice cream our mixed into a latte. Nice flavor. Balance of chocolate and caramel is just right. This has more depth of flavor than a regular chocolate syrup without being too sweet. This flavoring sauce is great in both hot drinks and on dessert. The salt with the chocolate and caramel is so decadent. Great price for such a tasty treat. Another great product from torani. This salted caramel granish is so good. We have used this in a bunch of different ways. From sweet to savory. A great flavored salted chocolate caramel sauce. It is perfect for flavoring coffee or ice cream. Comes in a very nice squeeze bottle with easy open cap. Great addition to our kitchen. Great flavor customers love it. Coffee, frozen drinks and more it helps. We will buying more in future. Thank you. The Torani Salted Chocolate Caramel Flavoring is NUMMY! What a way to perk up a cup of coffee or hot chocolate with a touch of clasls! LOVE this flavor, combining to of the most popular toppings was a brillant idea Toranit! Great bottle size, easy to pour and a no mess cap! 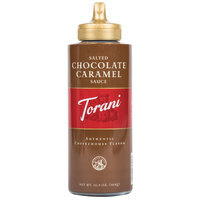 Torani Salted Chocolate Caramel Flavoring Sauce is the best thing to top off your Cappuccino. Pour in your espresso, a couple of pumps of Salted Caramel flavoring Syrup, whipped cream and drizzle with Torani Salted Chocolate Caramel Flavoring Sauce. Webstaurant store makes it easy to order and make sure to place on re-order and you won't run out and you save on shipping. You can't beat the service and prices that Webstaurant Store provides for their customers. I love this sauce. I use it to top my salted caramel pretzel cupcakes. It tastes amazing. I love it so much I put it in my coffee instead of sugar. Salted caramel is everywhere, but this salted CHOCOLATE caramel sauce, is a home run. So delicious on whatever you put it on. You can also stir it in your coffee for a great treat. The customers can't get enough of this syrup. I definitely have to buy this one by the cases. The price is great and the bottle is reusable as well. Excellent chocolate caramel adds a sweet twist on your everyday coffee. Kick up your taste buds with this sweet and tasty salted caramel sauce immediately. Used to top off the whipped cream on our salted caramel lattes. Small easy to use bottle that dispenses with easy for a perfect drizzle. This sauce is perfect inside a salted caramel Mudslide!! Great flavor and nice addition of the chocolate to the craze of Salted Caramel sweeping the nation! The Salted Chocolate Caramel sauce is amazing. We have it with ice cream, lattes, I have used it to drizzle on top of brownies before being baked. It is a must have! Chocolate is a good flavor and salted caramel is a great flavor and they've combined the two to make a terrific flavor. This is tasty, the best of all Torani products. Amazing tasting Toranin salted chocolate caramel. Torani offers a nice range of flavoring sauces at an affordable price. Customers love them. Was shipped really fast. This has a great infusion of both chocolate and caramel blend. The salt profile isn't too over powering and our customers love our Salted Chocolate & Caramel lattes! What's better than chocolate and caramel? Putting them together! This is my favorite all time ice cream topping. Torani always has a rich taste that can't be beat! I love this sauce! We use this as our chocolate sauce on drinks and ice cream. The salted caramel flavor comes as an after taste. really good! This salted chocolate caramel sauce is great. Torani is known for their good quality products and this sauce is no different. It makes a perfect latte! Another great product from Torani. This is a sauce that WebStaurant started carrying several months ago and they rarely have it on stock. We try to get a bottle each time we can as it is a household favorite. The Torani Salted Chocolate Caramel Flavoring Sauce is delicious! It goes great with the salted caramel latte and the chocolate caramel lattes. The dispenser works great for drizzling the topping on! This new product is extremely fabulous! It has a great flavor as all the Torani sauces do and it also has a runny like texture that is easy for pouring! Get them while you can because they are out of stock most of the time. Great new product, Webstaurant! This product was okay. It comes in a convenient squeeze bottle, which I like. The flavor, however, lacks the salted caramel and tastes more of just chocolate. We add additional salt and caramel sauce to bring up the salted caramel flavors.